In the old town section of the French city of Rouen, there’s a shop called Chocolateria Auzo that masterfully prepares classic sweets. In addition to its macaroons, its most famous product is bolstered by legend as well as taste. 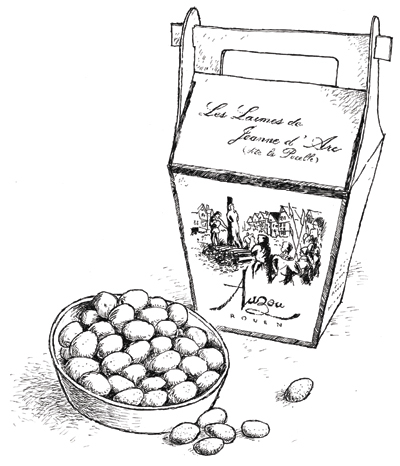 These are chocolate covered almonds known as “Joan of Arc Teardrops.” The relevance is that the shop is near the site where Joan, to be known as the Maid of Orleans and later canonized as a saint, was burned at the stake in 1431. For 10 of the 50 years of New Orleans Magazine’s existence, Joan has been the company symbol. A close-up of her statue that stands in the French Quarter was on the magazine’s first issue published after Katrina. It is a striking image; this young girl, an eternal symbol of youth, dressed as a knight, performing as a general in the face of adversity, her extended right arm elevating a flag as though to charge into the future, We needed Joan to inspire us back in 2005 as we picked up the pieces from the storm and wondered about our lives. With her as our logo, a new company – Renaissance Publishing – was formed. By coincidence, I spent a morning in Rouen during the time this anniversary issue was in production. It was in that town that the adventure of her life came to an end. According to legend, her being disguised as a boy gave prosecutors all the argument they needed to declare her to be a witch and to face the punishment. Her fate was met at the Place du Vieux Marché, a town square where the stake was placed in the center. Today, there’s a garden on the fatal site with a small monument marking the spot. At the front is a church, Eglise Jeanne d’Arc, which in this old city of medieval buildings is surprisingly modern. The roof, instead of being guarded by gargoyles and marble saints, swoops up to represent flames angling toward heaven. Leave it to Joan, stirring things up again. Old town Rouen is a busy area filled with quaint shops, cafes and omnipresent selfie-taking tourists, just like in old town New Orleans named after the French city of Joan’s conquest. Joan has been good for business. Historically she has also been good for inspiration. When teardrops are chocolate almonds, the world must be a better place.